His Royal Highness Prince Richard, the Duke of Gloucester talks to our future generation of talented architects whilst visiting our Belfast campus. 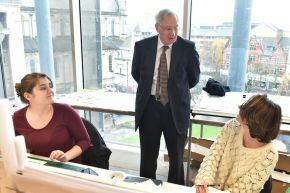 His Royal Highness Prince Richard, the Duke of Gloucester visited Ulster University's Belfast campus this week where he visited the School of Architecture. The Duke enjoyed a presentation of student work and took time to look at models and concepts developed by our future generation of talented architects. He was also presented with a set of bespoke cufflinks, handmade by one of the University's silversmithing students.